Enter a world of tender friendships, staunch loyalties, violent jealousies, and enduring love. In September 2008 Dorothy, a female chimpanzee in her late forties, died of congestive heart failure at Cameroon’s Sanaga-Yong Chimpanzee Rescue Center. 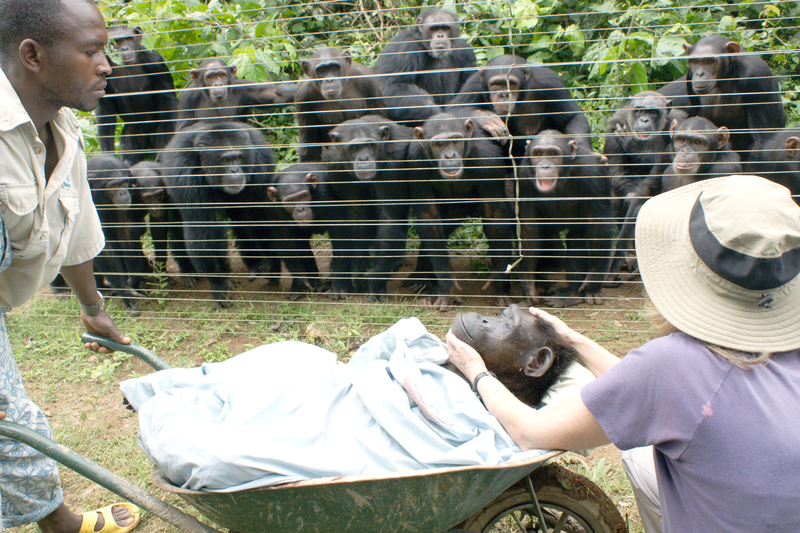 A photo of Dorothy’s funeral, in which Dr. Sheri Speede was cradling Dorothy’s head while her family of chimpanzees looked on, went viral after being published in National Geographic. The image was subsequently covered in hundreds of media outlets on television, in newspapers, and on blogs, deeply touching people around the world while showing once and for all that animals do indeed have feelings. Dr. Sheri Speede is the founder/director of In Defense of Animals-Africa and Sanaga-Yong Chimpanzee Rescue Center. Now she gives us Kindred Beings: What Seventy-Three Chimpanzees Taught Me About Life, Love and Connection, a touching and scientifically compelling memoir that follows Dorothy’s life from the time Sheri met her while she was tethered on a chain at Luna Park Hotel in 1999 until her death nine and a half years later at Sanaga-Yong Chimpanzee Rescue Center. In the book, Dr. Speede describes her relationships with the chimpanzees she comes to know and love, and their relationships with one another. She demonstrates that chimpanzees, like humans, are capable of a broad spectrum of emotions. Dorothy was consistently kind, gentle and forgiving. Along the way, Dr. Speede candidly reveals her own struggles as a stranger within a country and culture that were so different from what she had known. Books like Kindred Beings, which bring attention to the complex emotional lives of chimpanzees, can increase concern for their struggle to survive. But while this is a story about chimpanzees, it is also Dr. Speede’s story. Major events in her personal life unfold in her story of Africa and run parallel to the development of Sanaga-Yong Chimpanzee Rescue Center.